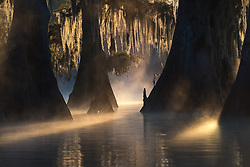 Beams of light filter through a forest of old bald cypress on a misty morning. Prints in our standard sizes may be purchased using the online shopping cart feature. Many, if not most, of my orders, however, are custom orders from savvy clients who have particular requirements for their artwork. Is there a particular size/dimension which fits your space perfectly? Is there a custom paper (or combination of papers) that you would like? I can handle most custom requests, and would be happy to provide my own recommendations for a particular photograph. Please include in your message the photo title and specific information to help us with your request (size, dimensions, paper, finish, mounting, lamination, etc). HTML Contact Box is loading . A lightbox allows you to collect your favorite images for later use, or to share with others. You may create multiple lightboxes and assign each one a title. In order for your lightboxes to be saved, you must sign up for a free account. A pop up dialogue will appear with the sizes and finishing options for the photograph you selected. For more about prints, see Print Information. For a list of Frequently Asked Questions, click here. You can check the status of your print order here. Don't hesitate to contact me with any questions. I generally respond within 24 hours when I'm not traveling. Thank you for your interest. While not traveling, I usually respond within 24 hours. Inquiries that are not business related will be handled as time allows. If you like what you see on your monitor, a print will have you mesmerized. Our Limited Edition prints are exhibition quality, gallery prints produced strictly in editions of 200, 100, or 50. Each order is worked by hand, with every detail overseen by me. These prints are highly limited, and very exclusive. Especially when paired with acrylic, these prints have a depth and dimensionality with colors so deep, they have to be seen to be believed. A print is the ultimate expression of a photograph. The true beauty of a photograph can only be realized by viewing it as a fine art print. 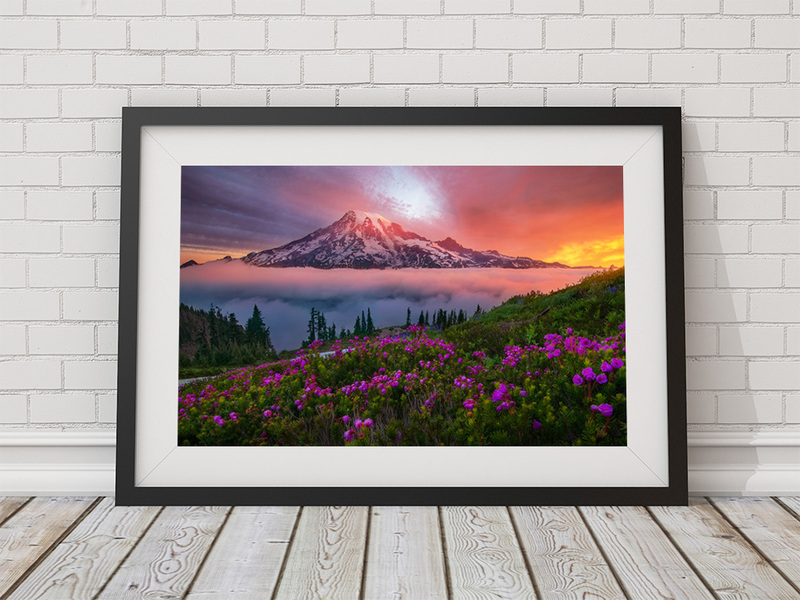 To accomodate personal taste in decor and budget, I offer a wide range of finishing options, including Lumachrome HD Acrylic Facemounts with framing options, Chromaluxe Metal, Canvas, and Fujiflex Supergloss Silver Halide Fine Art Prints. When purchasing a print, you can expect meticulous attention to color and detail. Turnaround time is 4-6 weeks. Unlike automated print services, I prepare each order individually. This involves making changes in luminance, color, and sharpening based on the paper used and print size. For larger prints, I will send you a proof to ensure your satisfaction. A print is the ultimate expression of a photograph. While browsing images on a computer monitor is nice, the true beauty of a photograph can only be realized by viewing it as a fine art print. Your investment in our prints transcends the fleeting satisfaction of viewing images on a computer or mobile device; a large fine art print provides viewing pleasure for you and your guests for years to come. If you like what you see on your computer monitor, a print will have you mesmerized. Especially when paired with acrylic, our prints have color so deep and dimensionality so real they have to be seen to be believed. These are not prints you would expect from the photo lab around the corner... we use only the highest quality professional paper and press available, and adhere to the highest standards for printing in the industry. Fine Art Prints are printed on professional papers selected individually for each print. These papers have an incredible gloss which creates a depth and dimensionality with colors so rich and deep, they have to be seen to be believed. In proper lighting conditions, the details appear to emerge in 3D from the depths of the image to bring the landscape to life... the colors really jump off the print! Black and White prints are printed on Ilford Galerie Silk paper, long regarded as a top choice for monochrome prints. When purchasing a print from Exploring Light Photography, you can expect amazing color and detail as you would enjoy in a fine art gallery. Turnaround time is 2-4 weeks. This is because unlike automated print services, I prepare photographs to print for each order individually. This is a time consuming process which involves making changes in luminance, color and contrast based on the paper used, as well as sharpening for the final output print size. All of this takes time, but ensures that you will be thrilled with the final result. Limited Edition prints (LEPs) are exhibition quality, gallery prints produced strictly and exclusively in editions of 200, 100, or 50. 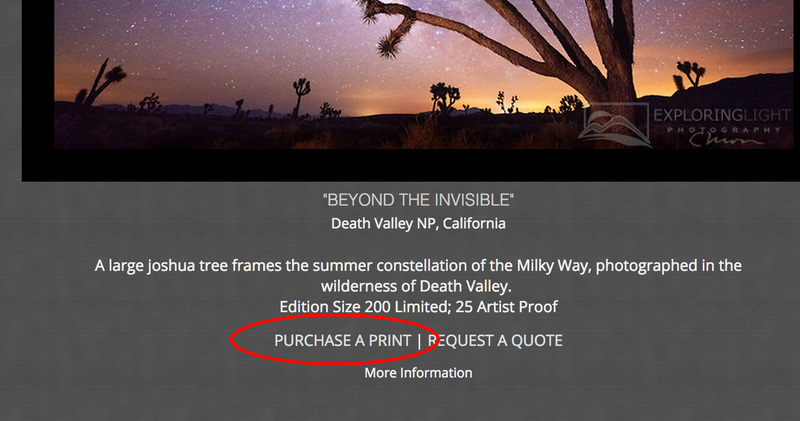 When the edition is sold out, no additional prints will ever be made. These prints are highly limited, and very exclusive. Each limited edition print captures a unique moment in nature, never to be seen again; your investment in our prints will not only grow as prices rise when prints sell through the edition, but will also provide a lifetime of viewing pleasure. Limited Edition Prints are registered and shipped with a hand signed and numbered Certificate of Authenticity (COA), which guarantees the original work. LEPs are priced according to the number remaining in the edition, with prices increasing in quartiles. ARTIST EDITION prints: A small selection of our masterworks in the ONEVision™ Collection are available as Lumachrome HD acrylic mounted prints in editions of 15. A hand signed and numbered Certificate of Authenticity (COA) designated "ONEVision Artist Edition," which guarantees the original work. Artist Edition Prints are designated numbers 11-25 in the edition when applicable. ARTIST PROOF/RESERVES are designated numbers 1-10 or 1-25 and will be released at my discretion, usually when the edition has sold out. On occasion, Artist Reserve prints will be made available to the public in our Collector's Vault, or during special pre-release events. UNIQUE EDITION prints are the MOST exclusive print anyone can own. Only ONE copy of this photograph will ever be printed. This is targeted strictly for art collectors or anyone who wants to own a one of a kind piece of fine art photography. OPEN EDITION PRINTS are custom prints produced to the exact specifications as the Limited Edition Prints, but are not numbered nor of limited production. Open Edition Prints are sent with a signed, un-numbered Certificate of Authenticity. The ultimate in gallery quality display, Face Mounted photographs have a vibrance and depth without equal. The face of your prints is mounted to a crystal clear acrylic sheet and backed with a floating recessed frame for hanging. Fine Art Prints are printed on professional papers selected individually for each print, with depth, dimensionality and colors so rich and deep, they have to be seen to be believed. Prints are hand signed by me on a small white border and are ready to frame. Canvas prints are printed directly onto Luna Artist Canvas 340 with Matte finish, stretched around a 1.5" wooden frame, leaving the full image visible on the front. Dyes are infused directly into specially coated aluminum sheets, creating truly archival works of art with a vibrant luminescence with incredible detail and resolution. Metal Prints are highly durable, waterproof, and scratch-resistant. Included are 3/4" thick lightweight foam blocks and aluminum plate with pre-drilled holes. The acrylic mounted print is lined with a 3" linen liner and framed in a 4" ROMA Hand Made Italian Tabbachino Dark Ash Frame. This presentation accentuates the art work, and the finished product is simply amazing. Truly the ultimate way to display your fine art print. Feel free to contact me to discuss a custom order. The online shopping cart provides a convenient way for customers to order prints in our standard sizes and finishes. To use this feature, click "Purchase a Print" under the photograph to add it to your cart. While it is recommended that you create a free account, you may also check out as a guest. An account allows you to view your order history, save your shopping cart, among others. Your purchase will be processed immediately. For more personalized service, you may fill our online order form. 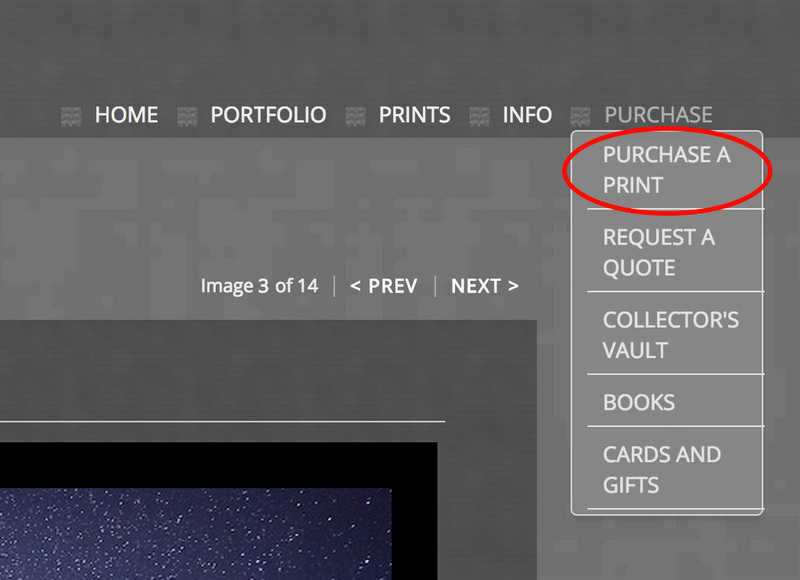 Click "Purchase a Print" in the Purchase menu at the top right of any page, and fill your order details. I will calculate shipping charges separately and send you an invoice based on your preferred payment method. I will work with you personally on your order, and because this method avoids certain processing fees, I am sometimes able to give a lower price. For custom ordering options such as size, finish, or other specific requirement, you may request a quote. I will personally work with you on your print order, and give my own advice regarding a particular photograph. Typical turnaround time is 2-6 weeks. Large prints, acrylic mounted prints, and canvas prints typically have longer turnaround times. This is because unlike automated print services, I prepare photographs to print for each order individually. For larger prints, I will typically make test prints and send you a proof to ensure the final product lives up to your expectations. All of this takes time, but ensures that you will be thrilled with the final result. Most prints are shipped flat using only archival packing material and reinforcements. Many large canvas and acrylic mounted prints are shipped in a custom crate. Included is a folio with information about your print and a hand-signed Certificate of Authenticity (COA).